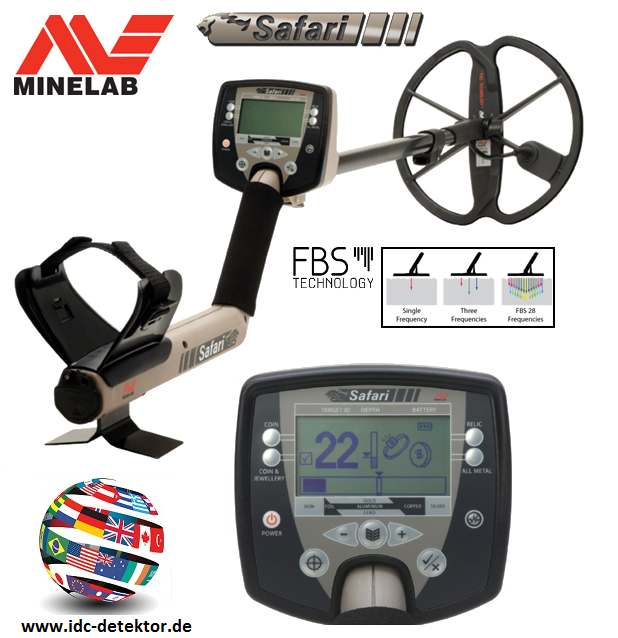 owered by Minelab’s Full Band Spectrum (FBS) multiple frequency technology, the Safari combines deep, sensitive and accurate detecting for anyone demanding both simplicity and performance. Safari uses advanced digital filtering to eliminate the influence of ground signals automatically so you can experience easy, seamless detecting whatever the field conditions. Ultra-lightweight 11″ Double-D waterproof coil combines high performance, great depth and sharp pinpointing. Four pre-programmed detection modes – Coin; Coin/Jewellery; Relic and All Metal. Each individual mode contains the optimum settings for identifying the characteristics of your preferred targets, allowing you to maximise your time in the field. Trash Density – High ensures fewer false signals experienced in typical coin and relic environments so you don’t waste time digging for junk, while low is ideal for clean sites to make sure you don’t miss anything. Target Volume Adjust – adapts target signal volume to suit user preference. Noise Cancel – automatically selects the quietest, most stable channel for detecting.